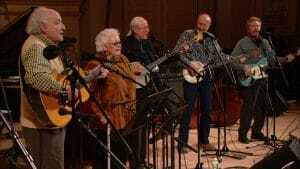 Connecticut Public Television > Inside CPTV > Folk Legends: Isn’t This a Time! Folk Legends: Isn’t This a Time! Treasure this last and historic gathering of the artists who defined folk music, including Peter, Paul & Mary, Arlo Guthrie, Pete Seeger, and The Weavers. The 2003 Carnegie Hall concert features performances the artists considered among their best. On CPTV: Monday, August 7 at 8 p.m.